by Robbert Gradstein, Museum National d’Histoire Naturelle, Paris, France. IAB executive committee meeting, St. Petersburg, 1975. 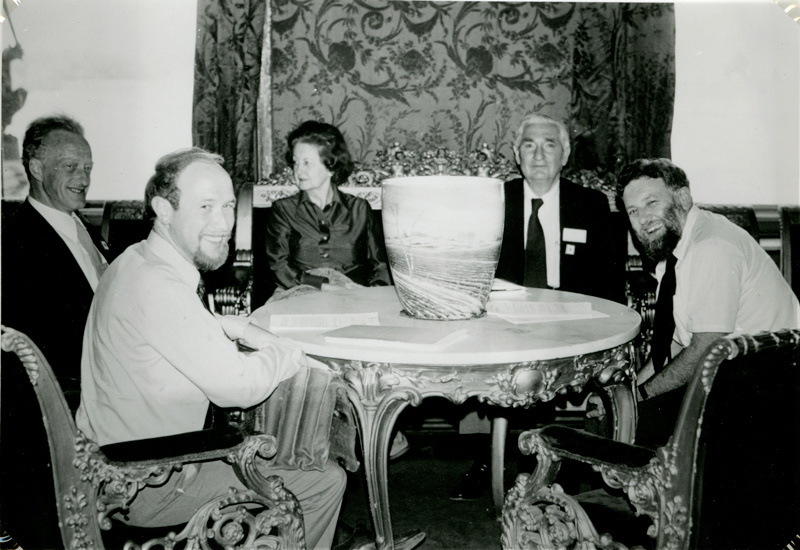 From left: Peter Florschütz (vice-president), Robbert Gradstein (secretary-treasurer), Dorothy Steere, Bill Steere (president), Stanley Greene (vice-president). (Photograph taken by Zennoske Iwatsuki). The idea of founding an international organization with the purpose of promoting worldwide cooperation and communication among bryologists had been long in the mind of bryologists in Europe and North America during the last century. It became a topic of informal discussion at the Pacific Science Congress in Tokyo in 1966, where a small group of bryologists met spontaneously to see what could be done to pursue the idea. 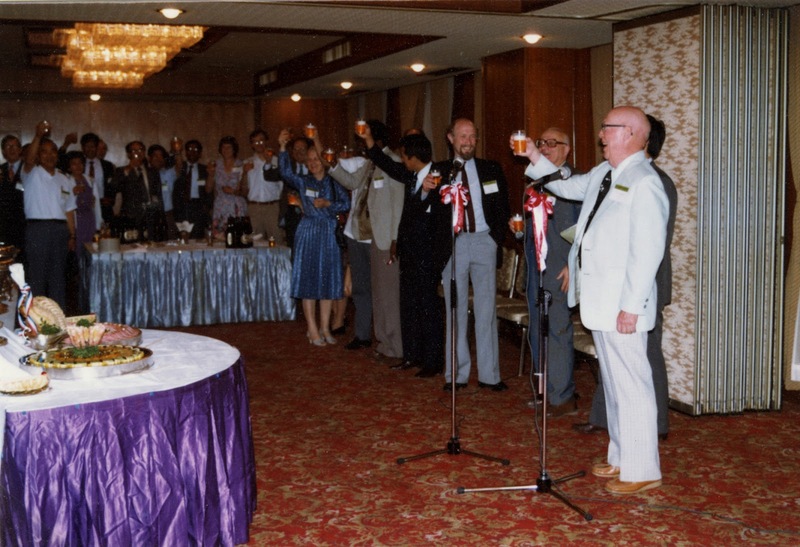 This informal meeting, attended by some 15 individuals, resulted in the establishment of an organizing committee consisting of William (Bill) C. Steere (U.S.A.) as chairman, and Stanley W. Greene (U.K.) and Zennoske (Zen) Iwatsuki (Japan) as vice-chairmen. The task of the committee was to draw up plans for the proposed International Association of Bryologists (IAB), prepare a preliminary address list and draft a constitution. After three years of preparatory work, the proposal to formally establish the IAB was put forward by Bill Steere at a special meeting of the American Bryological Society in Seattle, U.S.A., in late August 1969, at the occasion of the 11th International Botanical Congress. The motion to establish the new association was carried unanimously. At the meeting in Seattle, the secretary-general of the International Association for Plant Taxonomy (IAPT), Frans Stafleu (Utrecht, The Netherlands), proposed to place the IAB under the wings of the IAPT. The new organization would have the privilege of using the administrative offices of the IAPT for membership administration and the pages of the journal TAXON for the publication of its newsletter, the Bulletin of Bryology. Members of IAPT could be members of IAB free of charge, while those not being IAPT members were charged a nominal fee of US 1 $ (by 1985 raised to 8 $) to contribute to the costs of the newsletter, provided as a reprint from TAXON, and membership administration. Robbert (Rob) Gradstein, at that time a graduate student at Utrecht University, was considered a suitable candidate for general secretary of the new association because of his proximity to the offices of the IAPT. The proposals of Frans Stafleu were accepted and the first executive committee of the IAB was born, with Bill Steere as president, Stanley Greene as vice-president, Zen Iwatsuki as second vice-president and Rob Gradstein as secretary. As ruled in the draft constitution, the executive committee served for six years, until the 12th International Botanical Congress in St. Petersburg, 1975. Here, Lewis E. Anderson (U.S.A.) took over as president while Peter Florschütz (The Netherlands) and Ivan Ivanovich Abramov (Russia) became vice-presidents. Rob Gradstein was reelected and continued serving as secretary and manager of the IAB office for another twelve years, until 1987 at the 14th IBC in Berlin where Dale H. Vitt (then Edmonton, Canada) took over his position. 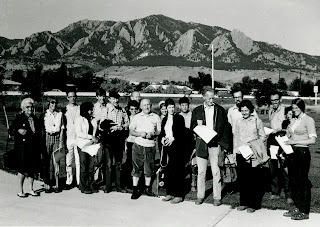 First IAB fieldtrip, Colorado 1973. From left: Eva Sobel, Patricia Nelson, Mark Seaward, Yolanda Alcorte, Gregory Kunkel, Robbert Gradstein, Marie-Claire Verdus, Willem Margadant, Ernest-J. Bonnot, Leila Shultz, Marie-Chantal Fabre, Kunito Nehira, Peter Florschütz, Norton Miller, Jeanne Florschütz, Andries Touw, Nancy Slack, Catharine Lafarge. (Photograph taken by fieldtrip organizer Bill Weber). During its early years the IAB grew steadily, from an initial 100 to about 300 members in 1973 and ca. 600 in 1985. By 1993 the number had declined to 422 but was up again to over 600 in 1999. A worldwide network of dues collectors was set up to help collect the membership fee. Also, calls were sent out annually asking for sponsorship of members in developing or communist countries where payments to the West were difficult or prohibited. Much effort was also made to make the IAB attractive to researchers from all disciplines, including ecology, physiology, chemistry, ultrastructure, genetics, etc. Indeed, some criticism had been expressed that the society was in the beginning too much biased towards taxonomy (Bryol. Times [BT] 4: 1-2. 1980 “IAB or IABT?”). With the growth and expansion of the IAB, it was eventually considered that the society should stand on its own feet and not be tied to an international organization focused on taxonomy and evolution such as the IAPT. With the move of the IAB office to Edmonton in 1987, the IAB de facto became an independent society. This allowed for developing a separate IAB budget, which was pursued with much vigor, and successfully, by the new secretary-treasurer of the association Dale H. Vitt. An endownment fund was set up for supporting awards and by 1992 the association’s net worth had surpassed 10.000 CAN$. The combined IAPT/IAB membership continued to exist for a few years (but no longer free of charge) until it was abandoned at the IAB meeting in Bejing in 1997. The independent status of the IAB was soon after written into constitution (BT 93: 14-17. 1997). 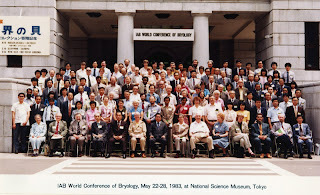 Delegates at the IAB World Conference of Bryology, Tokyo, 1983 (scan). 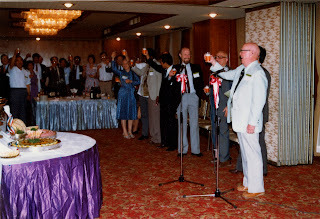 Lewis Anderson (past-president) toasting at the World Conference in Tokyo. On his right: Jerzy Szweykowski, Rob Gradstein and others. During the first 25 years of its existence the IAB organized thirteen international scientific congresses or symposia, usually at 2-year intervals: Boulder, U.S.A. (1973), St. Petersburg (1975), Geneva (1979), Vancouver (1980), Sydney (1981), Tokyo (1983), Vácrátót, Hungary (1985), Berlin/Mainz (1987), St. Louis (1989), Mont Rigi, Belgium (1989), Exeter, U.K. (1991), Yokohama, Tokyo (1993) and Mexico City (1995). The IAB conferences in St. Petersburg, Sydney, Berlin/Mainz and Yokohama coincided with the International Botanical Congress and the one in Boulder with the 1st International Congress of Systematic and Evolutionary Biology (ICSEB). Those in Geneva, Tokyo, Vácrátót, Vancouver, Mont Rigi, Exeter and Mexico City were organized by the IAB alone or jointly with local organizations. The number of participants usually varied from about 75 to 150, the largest meeting in history having been the World Conference of Bryology in Tokyo, May 1983, which was attended by more than 150 bryologists. During each event there was also a fieldtrip of one to several days. There were also a few bryological meetings in these years which were co-sponsored by the IAB, such as the CEBWG meeting in Kirovsk (Russia), the Congress of East Asiatic Bryology in Helsinki and the Endangered Bryophytes in Europea symposium in Uppsala, all held in 1990. 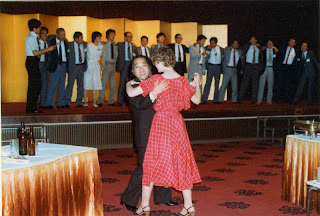 Hiroshi Inoue (president) and Diana Horton dancing at the World Conference in Tokyo. The congresses were as much as possible held in different parts of the world, depending on whether a local bryologist could be found willing to organize the meeting on behalf of the IAB. As a rule, there was an alternation of general meetings having a broad focus on bryology with those focusing on special themes. The meetings in St. Petersburg, Sydney, Tokyo, Berlin, Exeter and Yokohama were general conferences, those in Boulder (taxonomy and evolution), Geneva (taxonomy), Vácrátót (ecology), Mainz (bryological methods), Mt. Rigi (computer applications), St. Louis and Mexico City (tropical bryology) and Vancouver (ecological significance of morphological characters) were specialized ones. In many instances the Hattori Botanical Laboratory took care of publishing the proceedings, thanks to the generosity of its director Sinske Hattori. The papers appeared in the Journal of the Hattori Botanical Laboratory from which they were reprinted as a congress volume (Anderson 1974, Bonnot et al. 1976, etc. ); sometimes they were published as a separate book (Geissler & Greene 1981, Glime 1988, Pócs et al. 1987). The proceedings of the Vancouver symposium on ecological significance of morphological characters appeared in The Bryologist (Schofield et al. 1981), those of the St. Louis conference on tropical bryology in the newly established journal “Tropical Bryology” (Allen & Magill 1990), those of the Mont Rigi workshop in a “Computer Special” of The Bryological Times (Frahm & O’Shea 1990) and those of the Mexico City conference on tropical bryophytes in the Anales del Instituto de Biologia of the UNAM (Delgadillo 1995). Several committees were established during the early years of the IAB in order to help promote international cooperation and communication, and to help clarify the role of the young association in achieving these goals. The setting up of these committees was often recommended by the resolutions adopted at IAB conferences, e.g., at the taxonomic workshop in Geneva (TAXON 29: 370. 1980), at the World Conference in Tokyo (BT 21: 4. 1983), and at the Ecology Symposium in Hungary (BT 36: 7. 1986). The first IAB committee was the Glossary Committee (1979-1990, see below: Projects and Publications). It was soon followed by the Constitution Committee (1981-1985, chaired by Gert Mogensen), set up to review of the two kinds of IAB membership, council nominations procedures, etc. ; the IAB Publication Policy Committee (1981-1983, chaired by Lewis Anderson) to review the possible need for a news bulletin in TAXON and other publication matters; and the IAB Medal Committee (1981-1983, chaired by Stanley Greene) for setting up a system of IAB awards. The Medal Committee was later succeeded by Awards Committees, which handled the selection of candidates nominated by the IAB members for the different awards of the society. Based on a resolution adopted at the taxonomic workshop in Geneva and at the world conference in Tokyo, the IAB Standing Committee for Tropical Bryology (chaired by Claudio Delgadillo) and the Bryologia Africana Committee (chaired by Bob Magill) were set up in 1983 to stimulate research and development of bryology in tropical countries. News on their activities, especially of the Committee for Tropical Bryology, appeared in a special column of The Bryological Times edited by Dana Griffin and later on by Tamás Pócs (e.g., BT 64: 1-6. 1991). Concern about bryology in the tropics also instigated the organization of special tropical bryology symposia (Allen & Magill 1990, Delgadillo 1995) and the establishment in 1990 of the journal Tropical Bryology by Jan-Peter Frahm and Rob Gradstein. Finally, the growing concern about the worldwide endangerment of species and their conservation led to the establishment in 1990, at the IAB co-sponsored symposium “Endangered Bryophytes in Europe” in Uppsala, of the IAB Standing Committee for Endangered Bryophytes (ICEB) under the chairmanship of Tomas Hallingbäck. A subcommittee for Europe (chairman Edi Urmi) was set up to compile the European Red List of Bryophytes, which appeared in 1995, and to pursue further conservation-related matters in the region such as the organization of symposia (e.g. Bisang & Urmi, Cryptogamica Helvetica 18, 1995). The Standing Committee, which is still active today and is attached to the World Conservation Union as IUCN/SSC Bryophyte Specialist Group, has a.o. produced a first World Red List for bryophytes and a Conservation Action Plan (Hallingbäck & Hodgetts 2000). The activities of the two committees were at regular intervals reported in a special Conservation column in the Bryological Times edited by Tomas Hallingbäck and Edi Urmi (e.g., BT 59: 1-3. 1991; BT 66/67: 1-5. 1992). During the first twenty-five years, the IAB saw much project and publishing activity. IAB’s first publication was the Bulletin of Bryology, which appeared twice a year in TAXON being edited by Rob Gradstein (1971-1981), Gary Smith (1974-1975) and finally by Diana Horton (1986-1989). News items focused on new and ongoing projects, announcements and reports of meetings, activities of institutions, countries and bryological societies, personal news, requests, etc. Other IAB publications of the early years were the Directory of Bryologists and Bryological Research published in Regnum Vegetabile (Gradstein 1973, 1979), Bryological Herbaria – A guide to the bryological herbaria of the world by Zennoske Iwatsuki, Dale Vitt and Rob Gradstein in Bryophytorum Bibliotheca (1978), and the Index to bryophyte chromosome counts by Reinhard Fritsch published in Regnum Vegetabile (1982). A second edition of Bryological Herbaria together with the third edition of the Directory appeared in Bryophytorum Bibliotheca under the title Compendium of Bryology (Vitt, Gradstein & Iwatsuki 1985). In an agreement with the publisher J. Cramer, IAB members received a 75% discount on the Compendium and 25% on all other volumes of Bryophytorum Bibliotheca. The Compendium was a very useful work and publication of new editions should be considered. In 1981, the IAB began producing a bryological review series with J. Cramer, Advances in Bryology. Six volumes, edited by Wolfram Schultze-Motel (vols. 1-2), Norton Miller (vols. 3-5) and Royce Longton (vol. 6), were published during 1981-1997. After Royce Longton had stepped down as editor, a successor could not be found and the series ceased to appear. By 1980, it was felt that there was a need for more rapid dissemination of the daily bryological news, in a more informal way than was possible via the pages in TAXON. For this purpose The Bryological Times was established with Stanley Greene as its first editor. The newsletter appeared every two months [currently about three times per year] and was produced in mimeographed format. It was printed at the IAB office in Utrecht and distributed by mail (no internet in these days!) from Bejing (China), Eger (Hungary), Kingston (Tasmania), Missouri Botanical Garden (U.S.A.), Reading (U.K.), Tokyo (Japan), Utrecht and other places. The number of topics published was much larger than was possible in TAXON and included from the beginning stimulating and sometimes provocative opinion papers on a variety of subjects, including the functioning of the IAB. The myriad of topics is evidenced by the Index for the first 25 issues prepared by Bill Buck (BT March 1985), which was 16 pages thick and included more than 1500 items! Column editors for subjects of particular interest, such as Computer Techniques (Jan-Peter Frahm & Brian O’Shea), Ecology (Janice Glime), Nomenclature (Gea Zijlstra), Out and About in (Bill Buck), Taxonomy and Best Book Buys (Dale Vitt) and Tropical Bryology (Claudio Delgadillo, Dana Griffin, Tamás Pócs), greatly helped the newsletter to keep going. But the success of The Bryological Times was first and foremost due to the unfailing enthusiasm, ideas and energy of Stanley Greene who was one of the principal figures in the early history of the IAB and to whom the society owed much of its success. Stanley’s early passing away in 1989, shortly after having been elected as IAB president, was a great loss to the association. 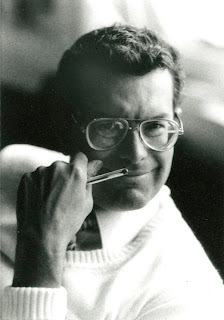 Following his death, the editorship of the The Bryological Times was taken up by Rob Gradstein, who had just completed his 18 yrs term as secretary and manager of the IAB. He edited the Times during four years, assisted by Guido van Reenen and Paula Greene. In 1993, Lars Hedenäs & Lars Söderström took over as editors of the newsletter, followed by Lars Söderström, Henrik Weibull & Terry Hedderson (1996-2002), Geert Raeymaekers (2002-2009) and DorothyBelle Poli (since 2009). The success of the Bryological Times made the Bulletin of Bryology redundant, at least temporarily, and the Bulletin stopped appearing in 1981. Following a plea by the “IAB Publication Committee” chaired by Lewis Anderson for continuation of publishing important bryological news items in TAXON, Bulletin of Bryology was revived in 1986, with Diana Horton as the new editor. The Bulletin appeared during another four years, until 1990, when it was finally discontinued. Further important IAB projects and publications from the first twenty-five years included the Conspectus of Bryological Taxonomic Literature by Stanley Greene and Alan Harrington (1988, 1989), a major reference for taxonomic publications which is still the only work of its kind and a most useful publication. Furthermore, the Biennial Supplement to the Index Muscorum by Marshall Crosby and to the Index Hepaticarum by John Engel, were published in the pages of TAXON. The publication of the moss supplement was later taken up by Missouri Botanical Garden (e.g., Index of Mosses 1992, now available in TROPICOS), of the liverwort and hornwort supplement by the Hattori Botanical Laboratory (Index of Hepatics 2006) and, more recently, Cryptogamie Bryologie. The hepatic supplements are currently prepared in the framework of the international project Early Landplants Today (von Konrat et al. : Cryptog. Bryol. 31: 3-30. 2010). The Index Hepaticarum as it stands today was greatly facilitated in the 1980s by the IAB. The project was started at the herbarium of Geneva in the 1950’s by the then curator of bryophytes Charles Bonner who prepared eight volumes single-handed (see BT 57/58: 1-2. 1990; http://briologia.blogspot.com/2008/11/index-hepaticarum-now-available-online.html). Upon Bonner’s death, the new curator Patricia Geissler together with Bonner’s former student Hélène Bischler (Paris) took responsibility for editing the remaining volumes with the assistance of the larger bryological community, including John Engel, Rob Gradstein, Riclef Grolle, Alan Harrington, Sinske Hattori, Hiroshi Inoue, Susanne Jovet, Denis Lamy, David Long, Harvey Miller, Tamas Pócs, Raymond Stotler, Jiri Vá?a, Kohsaku Yamada, Gea Zijlstra and others (Geissler & Bischler 1985-1990). Bonner’s daugher Silvia Willi was appointed by the Swiss National Foundation to assist in the work, which was completed in 1990 with the publication of volume 12. Patricia Geissler continued updating the Index and after her untimely death in 2000 this task was taken over by her successor Michelle Price, who made the Index Hepaticarum available online in 2008. 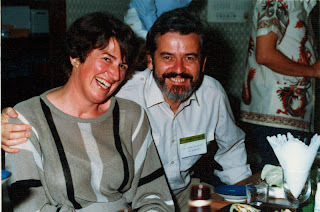 Patricia Geissler, organizer of the taxonomic workshop in Geneva (1979), and Wolfram Schultze Motel, editor of Advances in Bryology. In 1979, at the IAB taxonomic workshop in Geneva, the IAB Glossary Committee (initially chaired by Ella Campbell, later by Sean Edwards and Bob Magill) was set up with the purpose of preparing a multilingual glossary of bryophyte terms. The work of the committee resulted eleven years later in the eminently useful Glossarium Polyglottum Bryologiae (Magill 1990), providing lists of standardized terminology in seven different languages: English (by Bob Magill & Raymond Stotler), French (by Hélène Bischler & Denis Lamy), German (by Patricia Geissler & Jan-Peter Frahm), Japanese (by Zen Iwatsuki), Latin (by Patricia Eckel), Russian (by Olga Afonina and R.N. Schlakov) and Spanish (Gabriele Hässel de Menéndez). In 2006, a Portuguese version of the Glossarium was published by a team of Brazilian bryologists (A.P. Luizi-Ponzo et al. : Versão Brasiliera do Glossário Briológico. Editora UFJF). Dale Vitt, secretary-treasurer of the IAB during 1987-2005. The important activities of the IAB committees for bryophyte conservation, established at Uppsala in 1990, have already been mentioned above. Their work has been going on throughout the 90s and is still continuing. During the late 1980s and early 1990s, computer techniques for bryology were actively promoted by Jan-Peter Frahm and Brian O’Shea via their Computer Techniques column in The Bryological Times. They organized an IAB computer workshop in Belgium and initiated the IAB Software Library, making computer programs available free of charge (BT 59: 7-9. 1991). More than 250 disks were sent to bryologists around the world every year. The most important and far-reaching computer project initiated in these years was the BRYONET, an email discussion group developed in 1991 by the Swedish bryologist Gillis Een and operated during 1992-1996 by Jan-Peter Frahm at Duisburg University (BT 65: 6-7. 1992). The number of BRYONET subscribers grew rapidly, to about 170 in 1996. From 1996 onwards, Janice Glime at Michigan Technological University has managed the BRYONET, which was initially operated independently and became an official IAB activity in 2001. At the IAB taxonomic workshop meeting in Geneva (1979), the initiative was taken to award medals to bryologists in recognition of outstanding scientific contributions to bryology. The Hedwig medal, honoring life-time contribution to bryology and being awarded every six years at the International Botanical Congress, was the first medal established by the IAB. Recipients of the Hedwig medal have been Yoshinori Asakawa and Geneva Sayre (1983), Bill Steere (1987), Riclef Grolle (1999) and Lewis Anderson (2005). No Hedwig medal was awarded in 2011. Further awards established by the IAB include the Spruce award for outstanding contribution to bryology in the first 25 years of career (recipients: Jan-Peter Frahm 1995, Timo Koponen 1997, William R. Buck 2002, Benito C. Tan 2004, Jeffrey G. Duckett 2007, Jonathan Shaw 2009), the Hattori prize for best publication (recipients: Hélène Bischler 1995, Steven P. Churchill & Edgar Linares 1997, William R. Buck 1999, Jean Paton 2002, Hans Kruijer 2004, Jonathan Shaw 2005, Bill & Nancy Malcolm 2007, Neil E. Bell, Dietmar Quandt, Terry J. O’Brien, & Angela E. Newton), and the recently established Riclef Grolle award for excellence in bryodiversity research (first recipient: Claudio Delgadillo 2009). In addition, research grants are awarded by the IAB (Stanley Greene award established in 1990, conservation and endangered species grant). 1969-1975: William C. Steere (president), Stanley W. Greene (1. vice-president), Zennoske Iwatsuki (2. vice-president), Robbert Gradstein (secretary-treasurer). 1975-1981: Lewis E. Anderson (president), Peter A. Florschütz (1. vice-president until 1976†), Hiroshi Inoue (1. vice-president since 1976), Ivan I. Abramov (2. vice-president), Robbert Gradstein (secretary-treasurer), Howard A. Crum, Stanley W. Greene, Sinske Hattori, Hiroshi Inoue, Susanne Jovet-Ast, Timo Koponen, Willem D. Margadant, Elsa Nyholm, Wilfred B. Schofield, Wolfram Schultze-Motel. 1981-1987: Hiroshi Inoue (president), Hélène Bischler (1. vice-president), Tamás Pócs (2. vice-president), Robbert Gradstein (secretary-treasurer), Marshall R. Crosby, Stanley W. Greene, Zennoske Iwatsuki, Timo Koponen, Gert S. Mogensen, Wilfred B. Schofield, Wolfram Schultze-Motel, George A.M. Scott, Jerzy Szweykowski, Dale H. Vitt. 1987-1993: Stanley W. Greene (president until 1989†), Timo Koponen (1. vice-president; president 1989-1993), M.R. Crosby (2. vice-president), Dale H. Vitt (secretary-treasurer), Hisatsugu Ando, William R. Buck, Claudio Delgadillo, Jan-Peter Frahm, Patricia Geissler, Zennoske Iwatsuki, Norton G. Miller, Gert S. Mogensen, George A.M. Scott, Jerzy Szweykowski. 1993-1999: Timo Koponen (president), Wilfred B. Schofield (1. vice-president), Royce E. Longton (2. vice-president), Dale H. Vitt (secretary-treasurer), Hisatsugu Ando, William R. Buck, Tong Cao, Claudio Delgadillo, Jan-Peter Frahm, Patricia Geissler, Mikhail Ignatov, Norton G. Miller, Lars Söderström, Rodney Seppelt. 1999-2005: Robbert Gradstein (president), Wilfred B. Schofield (1. vice-president until 2003), Claudio Delgadillo (1. vice-president from 2003), Zennoske Iwatsuki (2. vice-president), Dale H. Vitt (secretary-treasurer), Geert Raeymaekers (editor BT), William R. Buck (until 2003), Tong Cao (until 2003), Barbara Crandall-Stotler, Marshall Crosby (from 2003), Hironori Deguchi, Claudio Delgadillo (1. vice-president from 2003), Efrain DeLuna, Johannes Enroth (from 2003), Jan-Peter Frahm (until 2003), Janice Glime, Tomas Hallingbäck (from 2003), Mikhail Ignatov (until 2003), Catherine La Farge (from 2003), Royce E. Longton, Rodney Seppelt (until 2003), Cecilia Sergio (from 2003). 2005-2009: Janice Glime (president), Claudio Delgadillo (1. vice-president to 2007), Masanabu Higuchi (1. vice-president from 2007), Benito Tan (2. vice-president), Blanka Shaw (treasurer), Geert Raeymaekers (secretary), Johannes Enroth (until 2007), Tomas Hallingback (until 2007), Catherine La Farge (until 2007), Marshall Crosby (until 2007), Cecilia Sergio (until 2007), Christine Cargill (from 2007), Uwe Drehwald (from 2007), Terry Hedderson (from 2007), Mikhail Ignatov (from 2007), David Long (from 2007). 2009-2013: Jeffrey Duckett (president), Masanabu Higuchi (1. vice-president to 2011), Jiri Váña (2. vice-president), James Shevock (secretary-treasurer to 2011), Matt von Konrat (secretary-treasurer from 2011), Christine Cargill (until 2011), Uwe Drehwald (until 2011), Terry Hedderson (until 2011), Mikhail Ignatov (until 2011), David Long (until 2011), Dietmar Quandt, Nadya Konstantinova, Matt Von Konratt (until 2011), Claudine Ah-Peng, Nancy Slack. Advances in Bryology (1981-1997). Published by J. Cramer, Germany. Vols. 1-2 edited by W. Schultze-Motel, vols. 3-5 (Ultrastructure, Systematics, Sphagnum Biology) edited by N.G. Miller and vol. 6 (Population studies) edited by Royce Longton. Allen B. & Magill R.E. (eds.) (1990). Proceedings of the Tropical Bryology Conference… St. Louis. Tropical Bryology 2: 1-284. Anderson L.E. (org.) (1974). Proceedings of the symposium on taxonomy and evolution of bryophytes…at the First International Congeress of Systematic and Evolutionary Biology, Boulder. Journal of the Hattori Botanical Laboratory 38: 1-168. Bonnot E.J., Gradstein S.R. & Greene S.W. (org.) 1976. Proceedings of the symposia on bryology…at the XII International Botanical Congress, Leningrad. Journal of the Hattori Botanical Laboratory 41: 1-230. Bulletin of Bryology (1971-1989). Published biannually in TAXON. Nrs. 1-5, 8-20 edited by S.R. Gradstein , nrs. 6-7 by G.L. Smith, nrs. 21-27 by D. Horton. Crosby M. (since 1974). Biennial Supplement to Index Hepaticarum. Published in TAXON (currently Missouri Botanical Garden). Delgadillo C. (ed.) (1996). Proceedings of the international bryological conference “Tropical Bryophytes: Biology, Diversity and Conservation,” Mexico City. Anales del Instituto de Biologia, Serie Botánica 67(1): 1-226. Engel J.J. (since 1974). Biennial Supplement to Index Hepaticarum. Published in TAXON (currently in Cryptogamie, Bryologie by M. von Konrat et al.). ECCB 1995. Red Data Book of European Bryophytes. Trondheim, 291 pp. Frahm J.-P. & O’Shea B.J. (1990). Proceedings of the IAB Computer Workshop, Mont Rigi. The Bryological Times 54: 1-12. Frey W. & Hattori S. (eds.) (1988). Proceedings of the bryological symposia at the XIV. International Botanical Congress, Berlin. Journal of the Hattori Botanical Laboratory 64: 1-236. Fritsch R. (1982). Index to plant chromosome numbers – Bryophyta. Regnum Vegetabile 108: 1-268. (updated version with different title published in Bryophyt. Biblioth. 40, 1991). Glime J. (ed.) (1988). Methods in Bryology – Proceedings of Bryological Methods Workshop, Mainz. The Hattori Botanical Laboratory, Japan, 403 pp. Glime J.M. (2007). Bryophyte Ecology. ebook accessible at . Geissler E.P. & Greene S.W. (eds.) 1981. Bryophyte Taxonomy – Methods, practices and floristic exploration. Proceedings of the IAB taxonomic workshop meeting, Genève. Beiheft zur Nova Hedwigia 71: 1-558. Geissler E.P. & Bischler H. (eds.) (1985-1990). Index Hepaticarum Vols. 8/9 (2nd. edition) and 10-12. J. Cramer, Vaduz & Berlin; Conservatoire et Jardin Botaniques, Genève; 1352 pp. Gradstein S.R. (1973). Directory of Bryologists and Bryological Research. Regnum Vegetabile 88: 1-67. Gradstein S.R. (1979). Directory of Bryologists and Bryological Research, 2nd edition. Regnum Vegetabile 99: 1-81. Greene S.W. & Harrington A.J. (1988). Conspectus of Bryological Taxonomic Literature. Part 1. Index to monographs and regional reviews. Bryophytorum Bibliotheca 35: 1-272. Greene S.W. & Harrington A.J. (1989). Conspectus of Bryological Taxonomic Literature. Part 2. Guide to national and regional literature. Bryophytorum Bibliotheca 37: 1-321. Hallingbäck T. & Hodgetts (compilers) (2000). Mosses, Liverworts and Hornworts. Status Survey and Conservation Action Plan for Bryophytes. IUCN, 106 pp. Hattori, S. (ed.) (1984). Proceedings of the world conference of bryology, Tokyo. Journal of the Hattori Botanical Laboratory 55: 1-325; ibid. 56: 1-269. Iwatsuki Z., Vitt D.H. & Gradstein S.R. (1976). Bryological Herbaria – A Guide to the bryological herbaria of the world. Bryophytorum Bibliotheca 8: 1-144. Iwatsuki, Z. (ed.). Proceedings of the symposia on bryology and lichenology at the XV. International Botanical Congress, Tokyo. Journal of the Hattori Botanical Laboratory 76: 1-311. Magill R.E. (ed.) (1990). Glossarium Polyglottum Bryologiae. A multilingual glossary for bryology. Missouri Botanical Garden, St. Louis, 297 p. (Portuguese version published 2006 by Editoria UFJF, Brazil). Pócs T., Simon T., Tuba Z. & Podani J. (eds.) (1987). Proceedings of the IAB Conference of Bryoecology, Hungary, Parts A-B. Symposia Biologica Hungarica 35: 1-902. Akadémiai Kiadó, Budapest. Ramsay H., Scott A.G.M. & Selkirk P.M. (eds.) (1982). Proceedings of the symposia on bryology at the XIII. International Botanical Congress, Sydney. Journal of the Hattori Botanical Laboratory 52: 1-302; ibid. 53: 1-296. Schofield W.B., Vitt D.H., Mogensen G.S., Bischler H. & Jovet-Ast S. (1981). Proceedings of the IAB/ABLS symposium on the biological significance of morphological characters. The Bryologist 84: 149-215. The Bryological Times (since 1981). Published 3-6 times per year by the International Association of Bryologists. Numbers 1-50 edited by S.W. Greene (1980-1989), nrs. 51-70 by S.R. Gradstein (1989-1992), nrs. 71-85 by L. Hedenäs & L. Söderström (1993-1995), nrs. 86-105 by L. Söderström, H. Weibull & T. Hedderson (1996-2002), nrs. 106-127 by G. Raeymaekers (2002-2009), nrs. 128– by D. Poli (since 2009). Vitt D.H., Gradstein S.R. & Iwatsuki Z. (1985). Compendium of Bryology. Bryophytorum Bibliotheca 30: 1-355. I thank Janice Glime for critically reading the text and for adding the 2005-2013 Councils, and Françoise Bouazzat for help with the pictures.